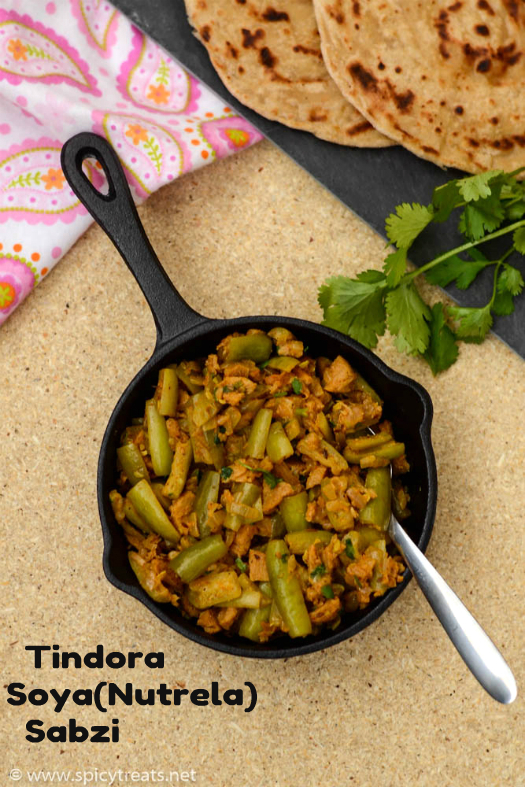 Today's recipe is a very healthy and filling sabzi using tindora and nutrela(soya chunks). I got this recipe from my neighbor Aunt and slightly tweaked to my taste. 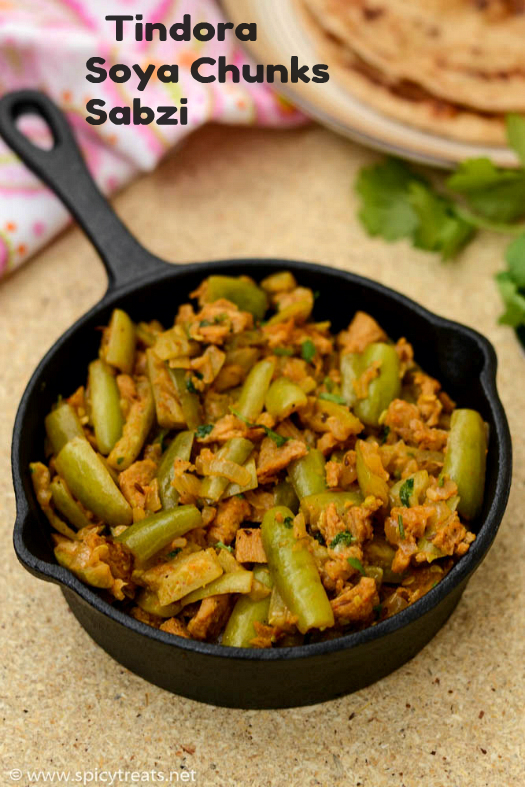 Aunty makes such a healthy and interesting sabzi with unique combo of veggies. I loved this Nutrela and Tindora combo, this sabzi is full of protein, fiber and very filling side that pairs well with Phulka. 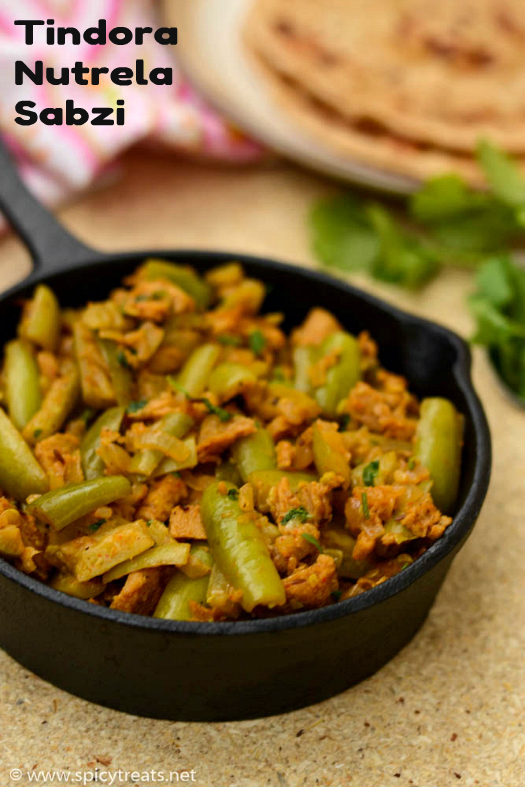 One or two phulka is more than enough for a meal along with 1/2 cup of this sabzi. I did not use tomato in this recipe and instead used curd/yogurt. If you want to make it Vegan, you can use 1/4 cup of finely chopped tomato or even skip tomato and curd and make it plain sabzi like Aunt's recipe. Wash and chop tindora and keep ready. I chopped it the previous day and kept it in freezer. Boil Water and when its starts boiling add soya chunks and cook till it is soft and then remove from the stove and drain it in a colander and wash in cold running water. Then drain well and squeeze the excess water and chop it roughly or pulse it in a food processor. After that, heat oil in a pan, when it is hot add cumin seeds allow to splutter and then add finely chopped onions, garlic, curry leaves and saute until the onion turns soft and golden brown. Then add chopped tindora and turmeric powder and stir fry well. After that add soya chunks, chilli powder, jeera powder, curd, enough salt and mix everything well and again cook covered for another 3 minutes. And then add garam masala, stir well and simmer for another 2 minutes and lastly add some finely chopped cilantro and switch off the stove. That's it..Tindora Soya Chunks Sabzi ready. Instead of soya chunks you can also use soya granules. You can skip garam masala and use curry powder or sabzi masala or kitchen queen masala also. If using tomato in the recipe, add the chopped tomato after sauteing onions and then add tindora. healthy subzi.. IS that iron cast pan? Yes.,Veena it is a mini Cast Iron Pan. This is an unique combination, Sangee.. Tindora and Soya chunks.. 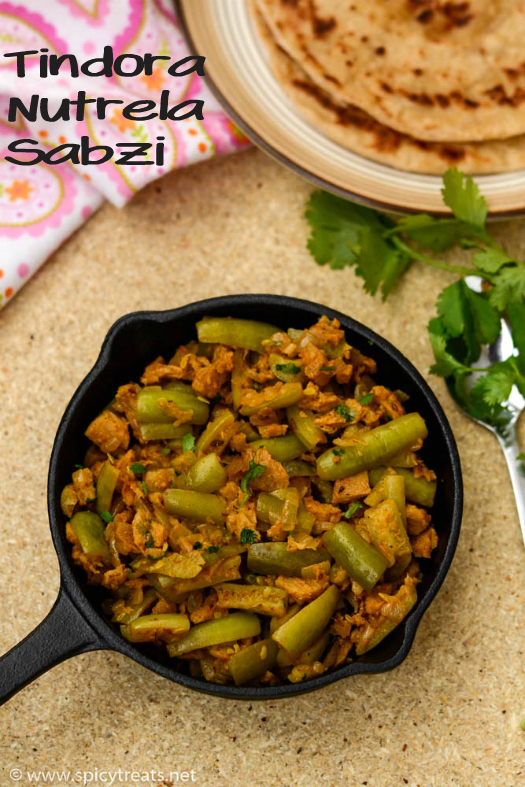 Healthy and tasty sabzi..
Quite a different and nutritious sabzi, interesting combination and never tried my hands in combining both these two humble ingredients. Awesome combination subji, this is a great way to enjoy veg food but with a non veg flavor.